Jurgen Klopp has made his midfield plans clear for the run-in, hinting Liverpool could change the centre of the park for the trip to Man United. 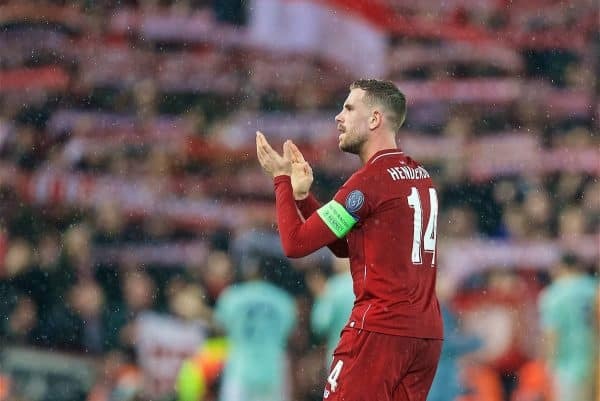 Jordan Henderson produced a big performance against Bayern Munich in midweek, particularly with his first-half showing. Naby Keita has improved week on week of late, while Gini Wijnaldum has been the stand-out all season in midfield—and Fabinho impressed too, albeit at centre-back. The boss also has James Milner as another option and Adam Lallana, while Alex Oxlade-Chamberlain is still working his way back to fitness and won’t be called upon as yet. 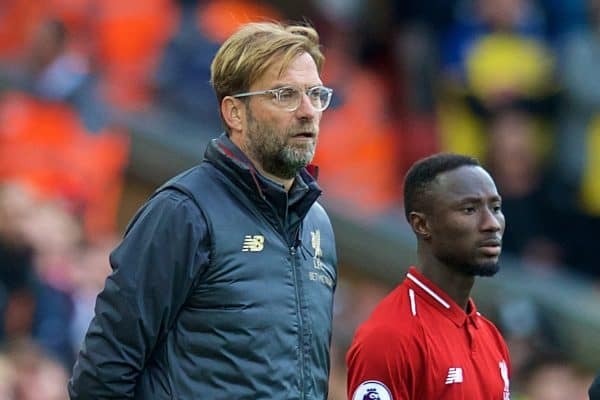 Those options give Klopp plenty of choice in terms of which attributes to select and rely on for any given game, and the boss told LiverpoolFC.com that the squad depth in that area will be utilised accordingly—and players must accept it. “I expect that the players just understand it. It’s a typical thing. “I will not explain to everyone why they don’t start because they will all start games. “We don’t have to talk about Ox at the moment because he needs a bit of time. He looks so good in training but we need to make him resistant for all the things that are coming up. With specific regard to Sunday’s game at Old Trafford, further comments from the boss hint at who could be involved. 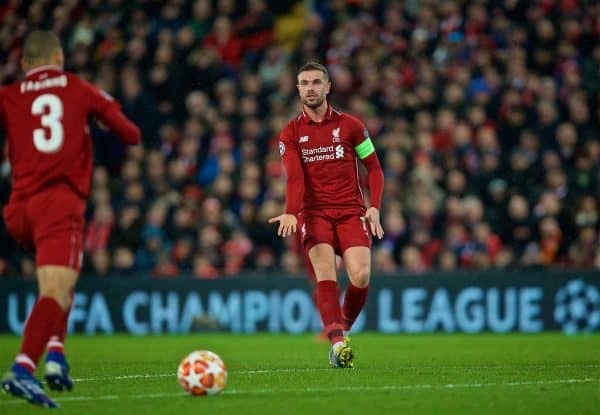 Henderson’s big performance as the No. 6 against Bayern was arguably the best of his season so far, but Fabinho has taken great strides over the past couple of months. At this point, he’s almost certainly guaranteed a starting spot, meaning the captain will probably either make way and move to the bench or else alter his role slightly. “Of course they cannot start all the time. If somebody makes a story of that, I’m not interested. “If somebody is not happy with that, I’m OK but you have to be ready for the next game and the next game is coming on Wednesday. That’s just how it should be. With regards to making “a story” of decisions, it could be surmised that the comments are made with Henderson in mind, being a somewhat divisive figure at times and each appearance in turn tiresomely used as “proof” for one camp or the other. 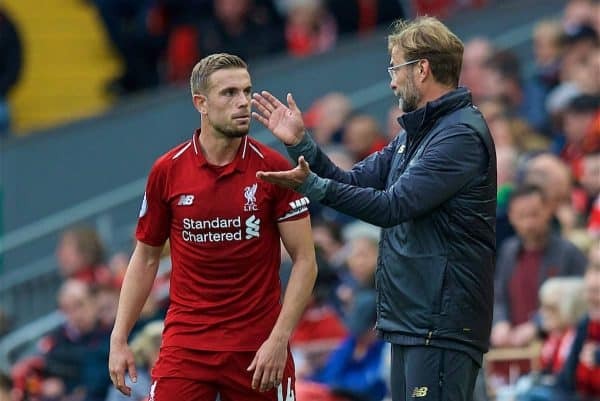 It’s also possible that Keita could come out of the team, if Henderson is either moved further forward or partnered in a double pivot with Fabinho. The Fabinho-Keita-Wijnaldum triumvirate played superbly against Bournemouth, however, and led to calls for it to be the go-to midfield trident for most matches for the remainder of the campaign. What’s almost certain is that Klopp will need more than just his starting 11 if the Reds are to beat Man United, though, meaning even those who start on the bench can still play a vital role—and will then, as the boss says, be needed for the following matches too.